STORK (holding basket) design. Price per bar. Available in 3 sizes. Suitable for baby showers or birth of baby. Personalisation on the wrapper can be changed to suit your requirements and is not limited to the wording we have included in these examples. The only wording we cannot change is anything included in the actual artwork itself. 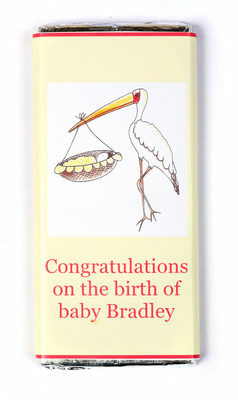 Please let us know when ordering what wording you would like on your wrapper and the size of bar you would like. All of our wrappers can have wording on the front and the back of the bar.